Your Hyundai should not be used to tow a trailer. 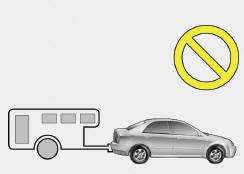 It is designed to be compact and light for good fuel economy, and is not designed as a trailer-towing vehicle. Damages or malfunctions caused by towing may not be covered by the limited warranties applying to your Hyundai. Damages or malfunctions that result from towing a trailer for commercial purposes are specifically not covered by Hyundai limited warranties.